Send these Happy Easter Printable Greeting Cards to family & friends. A free digital download featuring a watercolor bunny. Simply print, cut and send! Signs of spring are few and far between here in Ohio, but I’m plugging right along and adding touches of spring everywhere I can! Today is the next installment of Seasonal Simplicity and we are featuring spring-inspired printables. I love the idea of sending Easter cards to family and friends, but sometimes they are hard to find. 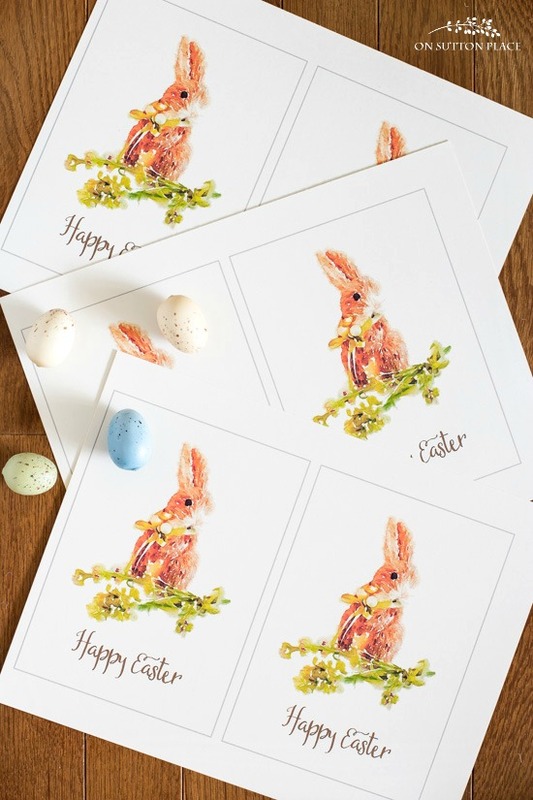 With that in mind, I designed these Happy Easter Printable Greeting Cards with a cute little watercolor bunny. To make things easier, I made this a flat card with no fold. It works best to print these cards on a good quality cardstock. When your printer pop-up opens, choose the “full page” or “fit page” setting. A short note and your signature can be written on the back. 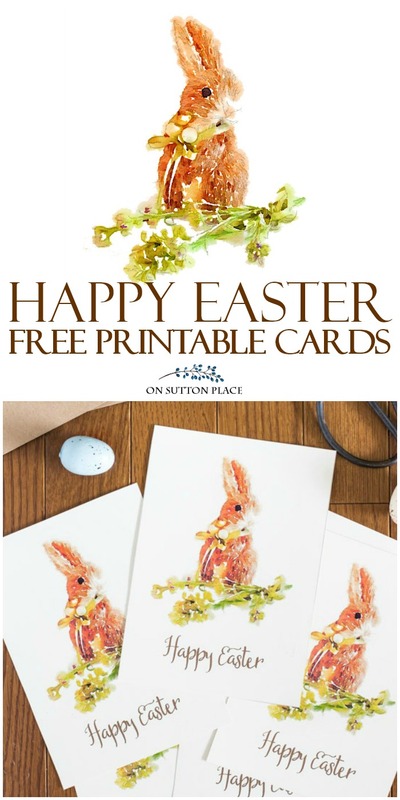 Click [HERE] to print the Happy Easter Cards! 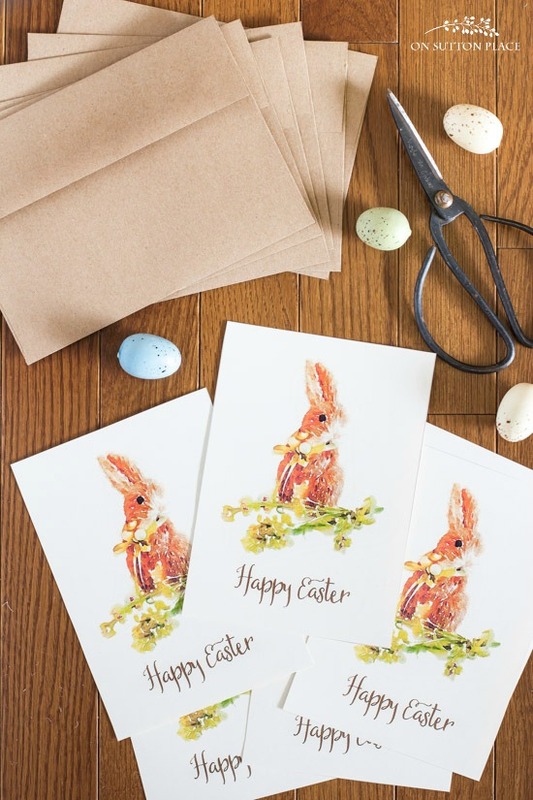 If you would like to mail these Happy Easter Printable Greeting Cards, I found both white and kraft envelopes that are a perfect fit. I just added them to my Amazon shop along with my favorite packs of cardstock. The cards in the photos were printed on the color of cardstock called Whitewash. You can visit my shop by clicking the button below. As an added bonus, I reformatted the greeting card image into two high resolution printables (text and no text) of this cute bunny that are suitable for DIY wall art, banners or even gift tags. If you are an OSP email subscriber, you can find these bunny printables in the Member’s Only Library. If not, just fill out this form and they will be emailed to you. It seems that we spend a fortune on cards every year. This little bunny is my darling. I just printed your cards to send along with gifts to my friend. Thank you so much for this post. This card is so beautiful! I just paid $$$ for Easter cards not nearly as Pretty as these! So now I am printing and sending more cards! Thx for such a quality project! Thank you so very much for access to your beautiful printables! I’ve been wanting to reduce the cost of cards this year. It seems that we spend a fortune on cards every year. I just printed your Easter card to send along with gifts to grandchildren. I also have printed your planner and use it daily. I sure hope you continue that every year! 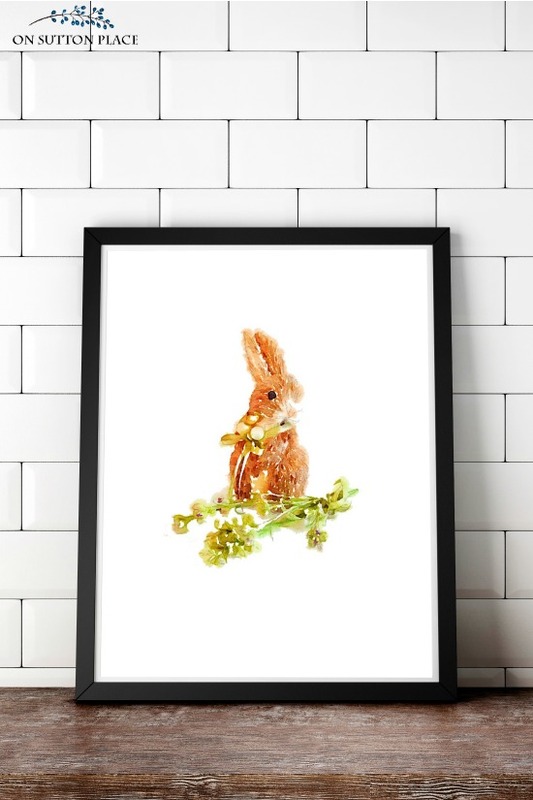 Ann Thank you for the beautiful bunny printable it’s adorable. Have a great day. An adorable Printable Ann! Thanks for all the suggestions for ways to use it too. Thanx for another great Easter print! These are adorable, Ann! 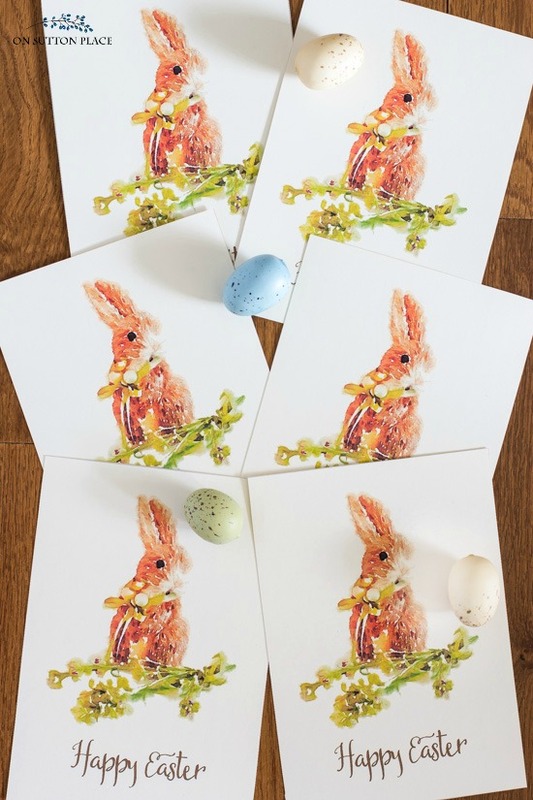 I love printable cards and these bunnies are the sweetest! I LOVE this Ann! So so sweet and pretty! Great design, thanks for sharing! Such a darling little bunny! Love this so much, Ann! Have a great week! Ann, these are just precious!! I’m going to print them out and send cards to family far away ASAP! Thanks so much for sharing! What an adorable printable, Ann! I love the Easter Bunny print. I would like to print a few to put in empty frames at our churche’s thrift store and offer them for sale but wouldn’t do it without asking permission. i didn’t see the comment section under the printable bunny post , but I had to leave you a warm thank you for sharing your printable. you have made it so easy . i ordered the card stock and the envelopes off your amazon site . what a cute card /gift to send . We are going to frame one in our home . This are precious. Thanks, Ann, for sharing your talent and creativity.